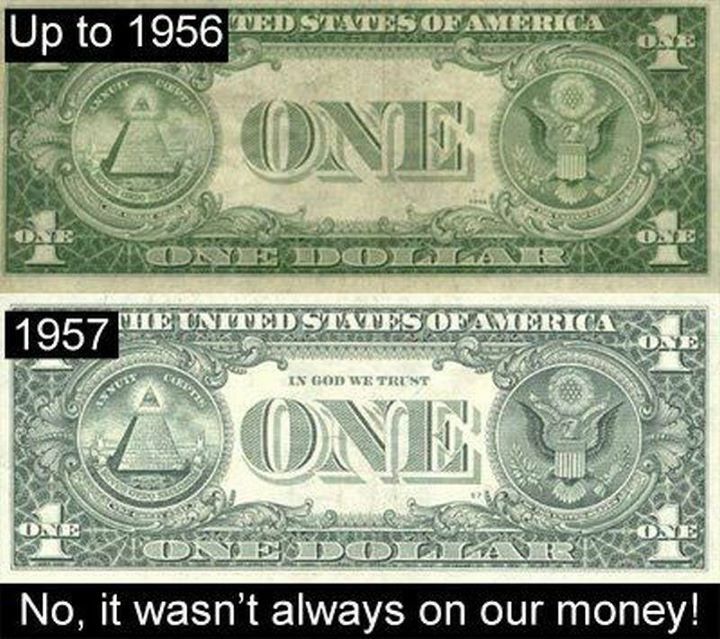 Money: History of ‘In God We Trust’: NO, it wasn’t always on our money! Dear Sir: You are about to submit your annual report to the Congress respecting the affairs of the national finances.One fact touching our currency has hitherto been seriously overlooked. I mean the recognition of the Almighty God in some form on our coins. You are probably a Christian. What if our Republic were not shattered beyond reconstruction? Would not the antiquaries of succeeding centuries rightly reason from our past that we were a heathen nation? What I propose is that instead of the goddess of liberty we shall have next inside the 13 stars a ring inscribed with the words PERPETUAL UNION; within the ring the allseeing eye, crowned with a halo; beneath this eye the American flag, bearing in its field stars equal to the number of the States united; in the folds of the bars the words GOD, LIBERTY, LAW. This would make a beautiful coin, to which no possible citizen could object. This would relieve us from the ignominy of heathenism. This would place us openly under the Divine protection we have personally claimed. From my hearth I have felt our national shame in disowning God as not the least of our present national disasters. To you first I address a subject that must be agitated. Dear Sir: No nation can be strong except in the strength of God, or safe except in His defense. The trust of our people in God should be declared on our national coins.You will cause a device to be prepared without unnecessary delay with a motto expressing in the fewest and tersest words possible this national recognition. I approve your mottoes, only suggesting that on that with the Washington obverse the motto should begin with the word OUR, so as to read OUR GOD AND OUR COUNTRY. And on that with the shield, it should be changed so as to read: IN GOD WE TRUST. Pledge of Allegiance of the United States: History of “Under God” – NO, it wasn’t always part of US pledge! The Congress passed the Act of April 22, 1864. This legislation changed the composition of the one-cent coin and authorized the minting of the two-cent coin. The Mint Director was directed to develop the designs for these coins for final approval of the Secretary. IN GOD WE TRUST first appeared on the 1864 two-cent coin. The use of IN GOD WE TRUST has not been uninterrupted. The motto disappeared from the five-cent coin in 1883, and did not reappear until production of the Jefferson nickel began in 1938. Since 1938, all United States coins bear the inscription. Later, the motto was found missing from the new design of the double-eagle gold coin and the eagle gold coinshortly after they appeared in 1907. In response to a general demand, Congress ordered it restored, and the Act of May 18, 1908, made it mandatory on all coins upon which it had previously appeared. IN GOD WE TRUST was not mandatory on the one-cent coin and five-cent coin. It could be placed on them by the Secretary or the Mint Director with the Secretary’s approval. The motto has been in continuous use on the one-cent coin since 1909, and on the ten-cent coin since 1916. It also has appeared on all gold coins and silver dollar coins, half-dollar coins, and quarter-dollar coins struck since July 1, 1908. A law passed by the 84th Congress (P.L. 84-140) and approved by the President on July 30, 1956, the President approved a Joint Resolution of the 84th Congress, declaring IN GOD WE TRUST the national motto of the United States. IN GOD WE TRUST was first used on paper money in 1957, when it appeared on the one-dollar silver certificate. The first paper currency bearing the motto entered circulation on October 1, 1957. The Bureau of Engraving and Printing (BEP) was converting to the dry intaglio printing process. During this conversion, it gradually included IN GOD WE TRUST in the back design of all classes and denominations of currency. As a part of a comprehensive modernization program the BEP successfully developed and installed new high-speed rotary intaglio printing presses in 1957. These allowed BEP to print currency by the dry intaglio process, 32 notes to the sheet. One-dollar silver certificateswere the first denomination printed on the new high-speed presses. They included IN GOD WE TRUST as part of the reverse design as BEP adopted new dies according to the law. The motto also appeared on one-dollar silver certificates of the 1957-A and 1957-B series. BEP prints United States paper currency by an intaglio process from engraved plates. It was necessary, therefore, to engrave the motto into the printing plates as a part of the basic engraved design to give it the prominence it deserved. One-dollar silver certificates series 1935, 1935-A, 1935-B, 1935-C, 1935-D, 1935-E, 1935-F, 1935-G, and 1935-H were all printed on the older flat-bed presses by the wet intaglio process. P.L. 84-140 recognized that an enormous expense would be associated with immediately replacing the costly printing plates. The law allowed BEP to gradually convert to the inclusion of IN GOD WE TRUST on the currency. Accordingly, the motto is not found on series 1935-E and 1935-F one-dollar notes. By September 1961, IN GOD WE TRUST had been added to the back design of the Series 1935-G notes. Some early printings of this series do not bear the motto. IN GOD WE TRUST appears on all series 1935-H one-dollar silver certificates.